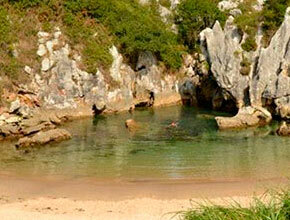 FROM VALLEOSCURU, IN ADDITION TO ENJOYING A UNIQUE RURAL EXPERIENCE, YOU WILL BE CLOSE TO LLANES: ENJOY IT! 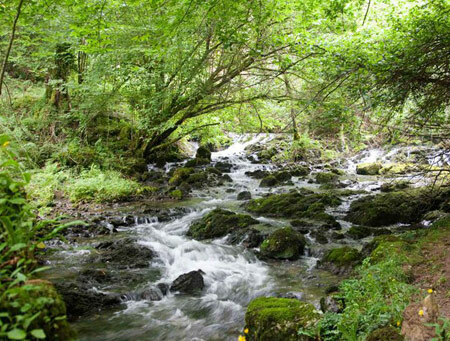 In our surroundings we have many possibilities to do tourism and enjoy nature, beaches, villages, culture or gastronomy. Next we are going to propose some plans to do from our rural hotel near Llanes. If what you want is to get to our rural accommodation in Llanes and leave the car parked until you leave, you can do it and enjoy the nature and hiking. We will start by visiting Tresgrandas and see the architecture of the village: to emphasize the laundry and the colt, the rest of the palace and the surroundings of the church where there is an area rehabilitated for the general leisure of the people: playground and bowling. You can take if you want some ciders in the village bar. There are plenty of paths near our rural hotel near Llanes that take you all over the Valleoscuru and you can climb up to the Sierra del Cuera. 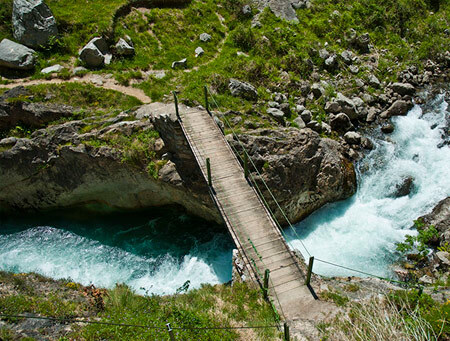 The most famous of the Routes would be the Route of the colors of the “Valle Oscuru”, a circular route of 13 km. which crosses 5 municipalities around the river Cabra. Here in the hotel we will indicate many more routes in the surroundings of our rural hotel near Llanes according to your interests. In the Sierra del Cuera there is a Route for those who like to climb to the highest peaks, which is the route of Picu’l Paisanu from where you can see all the Picos de Europa, with Naranjo de Bulnes, Cabrales, The Peñamelleras and at the same time the Cantabrian Sea, a real wonder! What does it rain? Well, with good clothes you can do any route along the paths and there will always be the hotel as a refuge next to the fireplace. 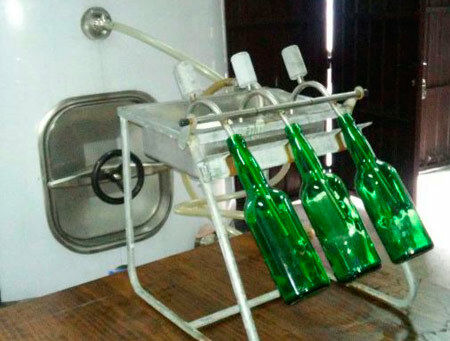 And of course, you have to see our cider sack where we will teach you all the machinery with which we make our Ecological Cider Valleoscuru and organic apple vinegar explaining the whole production process. To eat, in the village bar, or if you make some route there is always some bar where they can eat the plate of village potatoes, eggs and chorizo. And at night you have our traditional dinners with typical products of the area and our organic garden. If you want is to try authentic quality food, we would recommend places to enjoy a good fabada in Llanes, such as Casa Canene, or the best cachopo in the area, which is eaten in the Restaurant El Pontón in Noriega. In both places, good price and quality. To eat a good fish and seafood is the Restaurant El Balamu, where you can eat watching the sea and as the fishing boats enter with freshly caught fish at the wheel … impressive !! It has a higher price but the quality is assured. Another good option is the Mirador de Toró Restaurant. If you like the sea more, you can not stop making the route of the cliffs as they are incredible places. Here you have to “play with the tides” and depending on the time you go to one site or another. Do not worry because we will inform you in our rural hotel near Llanes. The Buffoons of Pría next to Llanes. The buffoons of Arenillas in Puertas of Vidiago. The beach of Gulpiyuri, an inland beach to which the water reaches you through a cave. The beach of Cuevas de Mar. The beach of La Paz in Vidiago. Complex of Cobijeru and its cave that goes out to the sea. 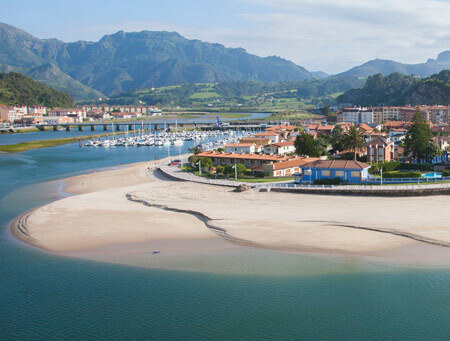 At 30 minutes from the hotel, along a very beautiful coast route you can make a 1 hour route called the Route of the Resquilones where you can enjoy spectacular viewpoints of the entire Cantabrian coast. To finish, you can go to the village of El Mazuco and eat at the Restaurant el Roxín, famous for the steaks and the excellent price quality. 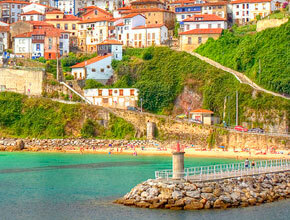 There are many villages that are worth visiting near our rural accommodation in Llanes. The same Llanes (20 minutes) and its cinematographic routes, its old town, the cubes of memory or the paths in the cliffs. Ribadesella, , its port, the beach of Sta. 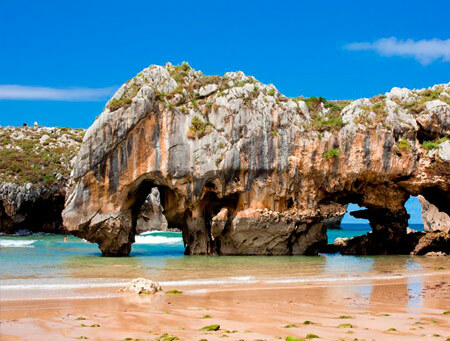 Marina, The Caves of Tito Bustillo and very close to the Town of La Vega, with its small-great gorge and its beach. 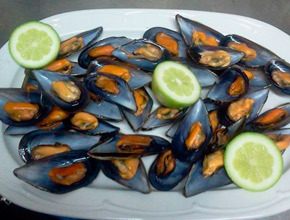 There is a Restaurant: El Gueyu Mar, where they make one of the best grilled fish you can try. Colombres and its archive of Indians, , the town of Pimiango and its prehistoric caves and the route of Tina. San Vicente de la barquera (17 minutes) and the natural park of Oyambre stopping to eat in the Restaurant El Pescador or the BogaBoga if you want great quality but with a high price. If you prefer it at Casa Cofiño in Caviedes, you can eat a good stew mountain at a good price. Nearby is also Comillas (30 minutes), seaside villa with the Pontifical University, palaces and Capricho de Gaudí, a marvel. Starting at the beautiful fishing village of Cudillero (at 1:30 am from the hotel). 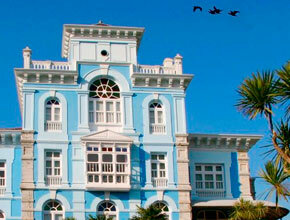 Located between 3 hills on which rests its picturesque and colorful houses of fishermen. If we add the fishing port and its amphitheater make of this town one of the most photographed places. 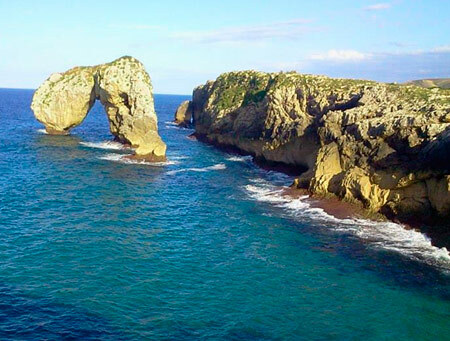 Cabo Peñas is the northernmost tip of Asturias. Declared Protected Landscape, has a center of interpretation of the Marine Environment in the surroundings of the lighthouse. Its cliffs, panoramic views and spectacular scenery will make this a visit to remember. The beautiful and unique village of Lastres, whose historic center has been declared a Property of Cultural Interest. Its traditional houses and cobbled streets overlook the sea. From the viewpoint of San Roque you can enjoy a beautiful view of the town, its port where it is a nice marine life, its beaches, the Sierra de Sueve, and even on clear days the Picos de Europa. If you want to enjoy the Picos de Europa, we also have them in the vicinity of our rural hotel near Llanes. .
Cangas de Onis (50 minutes), with its Roman bridge. Within the same council and forming part of the Picos de Europa is Covandonga, you can not miss the visit to the Santa Cueva, the Monastery of San Pedro and the Basilica of Santa Maria la Real. Climbing towards the Covandoga Lakes we propose to make a simple route that passes through the Mines of the Buferrera and the lakes Ercina and Enol. Cabrales, Poncebos, the Route of the Cares and Sotres. Small mountain villages very typical of the Picos de Europa where you can discover the nature, essence, constructions and traditional way of life of the villages of Picos. Of Cabrales it is possible to emphasize its milk, with which is elaborated the cheese of Cabrales, of international fame. Panes, Potes, Fuente Dé with its cable car (one of the biggest attractions of the Picos de Europa) and the Monastery of Santo Toribio, which in 2017 celebrates its jubilee year. In the area of Potes you can eat very well in Casa Cayo, Casa Fofi and in Panes in La Covadonga. Of course, all these plans can be combined according to your tastes and preferences or if you are several days you can do them all, the most important is to enjoy Asturias and our rural accommodation in Llanes. Also in the hotel we will give you much more information, since we are in an ideal area to move and where the possibilities are many.